Double buns are sooo last century. Triple buns are the current rage among galactic gals and we're loving the new trend! Don't get us wrong, Princess Lei's side buns are pretty epic and it's a hairstyle that's received its fair share of attention. But like all iconic trends, this unique hairdo called for an update and thanks to Rey, it got one! Instead of rockin' the double buns, Rey revamps the look and sports three top knots down the center of her part; like a futuristic mohawk. If you'd like to give this hairdo a shot, but your hair styling skills are not as strong as your lightsaber wielding skills then this wig is for you. 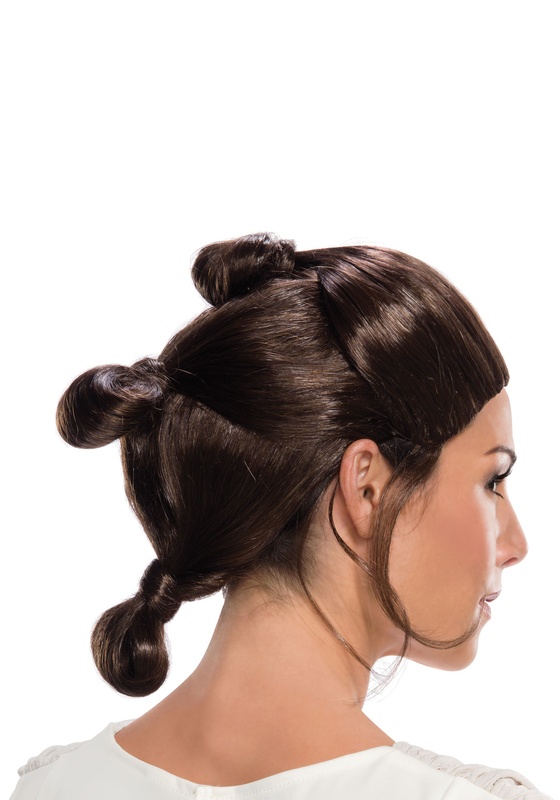 The Star Wars adult wig features synthetic hair fashioned into knots which cascade down the center of the head. Finally, an elastic mesh cap makes the wig stretchy and comfortable to wear. Wear it out for an evening of scavenging for metal scraps or scavenging for treats!